Enhanced authentication is the need of the hour in today's technology. Commonly used login and password are not enough as they may be guessed by imposters. Most of the websites adopt the traditional authentication as login and password. But they don't verify whether the same person is accessing their information continuously in the current session. This is of great concern in distance-based e-learning systems. The institutes offering the e-courses must verify whether it is the same student who enrolled, is accessing their materials, doing the assignments themselves, and completing the examination without any cheating. In this case, one of the techniques, behavioral biometrics-keystroke dynamics, plays a very important role. 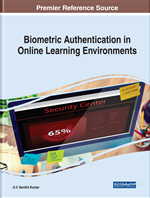 Along with other authentication methods, keystroke dynamics can be combined to provide a more secured system for the students in e-learning environments. In this chapter, the basics of keystroke dynamics and some of the applications that use them are discussed. The emergence of Massive Open Online Courses(MOOC) has brought a new attention to ensuring integrity in a global online classroom. The verification of student in online examinations and distance education programs are very important factors in the successful implementation of an e-learning program. After completion of the course, writing examination and giving of credits to the student who completed the given task is very important in successful running of the course and maintaining the reputation of the institution and running the course continuously. The traditional class room teaching is more equipped with these types of courses and those who are not able to join colleges and universities can benefit from these types of online distance learning programs. Coursera - founded by Stanford professors Andrew Ng and Daphne Koller offers online courses. Coursera is partnering with world top universities and offer courses online. It provides 800+ online free courses and works with world class universities and other organizations to offer online courses, specializations, and degrees in a variety of subjects such as engineering, humanities, medicine, biology, social sciences, mathematics, business, computer science, digital marketing, data science, and others. Udemy.com is a global marketplace for learning and teaching online which offers nearly 65,000 courses taught by expert instructors. Udacity is a for-profit educational organization founded by Sebastian Thrun, David Stavens, and Mike Sokolsky offering massive open online courses (MOOCs). Edx.org provide various online courses with cutting edge technology in collaboration with various universities like Massachusetts Institute of Technology, Harvard University, Berkeley University of California, The Hongkong Polytechnic University, University of Texas, and so on. Khan Academy is a non-profit educational organization created in 2006 by educator Salman Khan with a goal of creating a set of online tools that help educate students. They release their courses as YouTube videos and the supplementary practice exercises and materials are available to their students. Other than English, they also provide the content in languages like Spanish, Portuguese, Hebrew, Italian, Russian, Chinese, Turkish, French, Bengali, Hindi, German. MIT OpenCourseWare (MIT OCW) is an initiative of the Massachusetts Institute of Technology (MIT) to publish all of the educational materials from its undergraduate – and graduate-level courses online, freely and openly available to anyone, anywhere. The program was originally funded by the William and Flora Hewlett Foundation, the Andrew W. Mellon Foundation, and MIT. SWAYAM is a programme initiated by Government of India and its main principle are access, equity and quality. The objective is that even most disadvantaged also will be benefited at maximum. The courses are prepared by more than 1000 specially chosen faculty and teachers across the country. All most all the courses are free of cost for studying. Only if the student want to get certificate then he/she has to pay a minimum amount and they are allowed to write online examination and the certificates and credits are awarded. The courses are developed in IT platform with rich multimedia, audio and video presentation which make the learning experience an enjoyable one. In order to ensure best quality content are produced and delivered, nine National Coordinators have been appointed: They are AICTE for self-paced courses, NPTEL for engineering, UGC for post-graduation education, CEC for under-graduate education, NCERT & NIOS for school education, IGNOU for out of the school students and, IIMB for management studies. UGC has already issued the UGC (Credit Framework for online learning courses through SWAYAM) Regulation 2016 advising the Universities to identify courses where credits can be transferred on to the academic record of the students for courses done on SWAYAM.